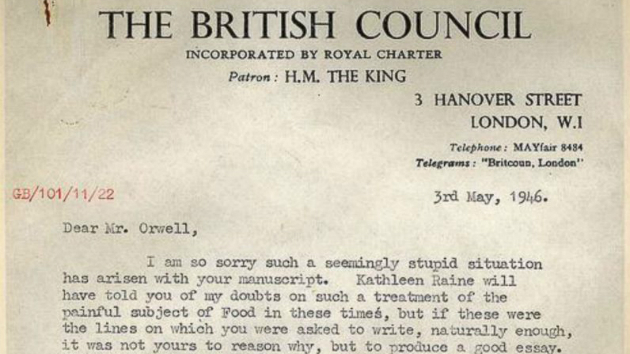 British Council(LONDON) — An arts foundation in England has released an unpublished culinary essay by the legendary author George Orwell, complete with an apology to the writer more than 70 years after it was initially rejected. The essay, entitled “British Cookery,” was a defense of what Orwell described as the “slightly barbarous” diet of the English. The British Council now says it’s delighted to finally publish the essay. Orwell’s reputation has enjoyed a resurgence in recent years. In 2017 his most famous work, the dystopian classic 1984, shot to the top of the Amazon best-seller list after White House counselor Kellyanne Conway used the phrase “alternative facts,” according to The New York Times. Orwell coined the words “doublethink” in 1984 — meaning the way someone can hold two contradictory views at the same time.